Dukes Bar: 41-43 Old Dumbarton Road, Glasgow. G3 8RD. Once known as Bar Booshka a specialist vodka bar, selling over 100 different brands. It didn’t last very long here during the 1990s, a big shame as it was a really good bar. The history of this old pub can be traced back to 1877 when Sarah Dow was landlady, Sarah was born in the Isle of Bute, she was a widow at the ago of 50 and had to look after a family of two sons and two daughters, her eldest son John helped her run the family business of pubs in Argyle Street and Old Dumbarton Road. The Dow family continued to serve here until 1891 when the licence was transferred to William Algie. 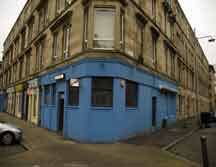 Donald McNeish took over the pub in 1897 paying an annul rent of £80.00. The McNeish family continued in this popular howff until the 1960s. The Pub is now called Bar Transit. Tel: 0141 357 5247.